For the remainder of the summer, each week we will take a deeper look at a basketball movie. Some you know, some you don’t. 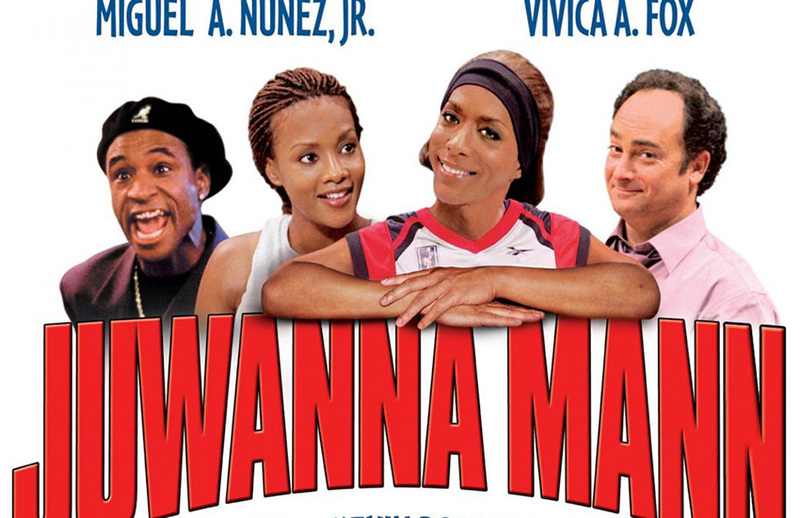 Today brings us Juwanna Mann, the 2002 cross-dressing comedy starring Miguel A. Nuñez Jr., Vivica A. Fox, Kevin Pollak, Tommy Davidson, a smattering of NBA stars, and a galling lack of respect for women. With the WNBA, it’s important to take the long view. The NBA was an afterthought in the sports conversation for some 40 years. In the league’s early years, it was not uncommon for a basketball doubleheader to feature two NBA teams followed by the Harlem Globetrotters, which is who fans really wanted to see. Success in sports is generational; the WNBA just turned old enough to buy a beer. Sports and perspective occasionally lose contact, especially among the troglodytes, a group that lacks the ability to incorporate real life into the games. (Ask these folks their opinion about the national anthem protests or on women broadcasters.) I am not a diehard WNBA fan, but I love that young girls have athlete role models, and that a sports option exists for me beyond the summer league or the Mets bursting into flames. But for men who consider sports their domain, the WNBA is an annual affront, one they must comment on whether you like it or not. They must complain about why the NBA is footing the bill, or the abilities of the players, or (God help us) their attractiveness. I am convinced that the alleged comedy Juwanna Mann was made by—and for—these meatballs. I could have listened to the director’s commentary on the DVD to make sure, but I feared a second viewing would destroy my ability to appreciate beauty and joy. The movie is misogynistic and unfunny and mean and dumb. Yet people find it funny, a fact that depresses me. The smartest thing about Juwanna Mann is the NBA distanced itself with this hateful nonsense. The UBA’s star player is Jamal Jeffries (Miguel A. Nuñez Jr., erstwhile wingman for Lakers owner Dr. Jerry Buss), who makes Nick Young look like John Stockton. During one contest, an out-of-control Jamal gets removed by his coach. Jamal protests by taking off his jersey. Then his shorts. And his jock strap. Jamal’s team cuts him; the league suspends him indefinitely. Jamal’s Magic Mike routine voids his guaranteed contract, forcing a broke Jamal to move in with his no-nonsense aunt (Jenifer Lewis). He goes stir-crazy. No team on the planet wants him. A trip for groceries provides an idea. He passes a pick-up game: Wait a minute, girls can play basketball too! Jamal dons a pair of massive falsies, slaps on a wig, and adopts a ridiculous Foghorn Leghorn accent to become Juwanna Mann. 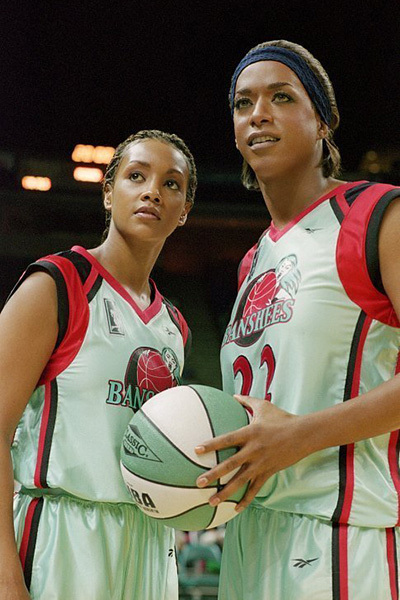 “Juwanna” tries out for the Charlotte Banshees—God, what an awful name—and makes the squad. Jamal is relieved. His put-upon agent, Lloyd (Kevin Pollak, who signed on when Will Smith was apparently attached), is horrified when he discovers the ruse. But the contract is signed. They’re in it now. So are the viewers. Jamal’s desperation doesn’t abate his raging ego. He holds on to the ball like a toddler clings to their blankie. This disgusts the team’s star player, Michelle Langford (Vivica A. Fox), who is forced to work with Juwanna when an injury forces her into the starting lineup. Because the script is bankrupt of ideas, the two grow close, with Jamal trying to tamp his feelings for Michelle while learning how to act like a woman. Tootsie covered this territory 20 years earlier, but it was funny and a had a wonderful cast to excuse its shortcomings. (As one of the film’s stars, Teri Garr, told the A.V. Club in 2008: “Pretty, nice girls being taken advantage of by slimy men. They put a man in a dress, and he’s supposed to know what it feels like to be a woman. But, of course, he doesn’t. I think what Dustin [Hoffman] says is, “I realize now how important it is for a woman to be pretty. And I wasn’t pretty.” God! That’s all you realized?”) Juwanna Mann plays dumb for the full 90 minutes, neglecting to cover how men and women think or even serving as a platform for women’s basketball—which would have justified its existence. Juwanna Mann exists to promote mean-spirited jackassery under the guise of enlightenment. It mocks the transgender community, courtesy of a cop who turns from stern to effeminate when a cross-dressing Jamal lies about his driver’s license. 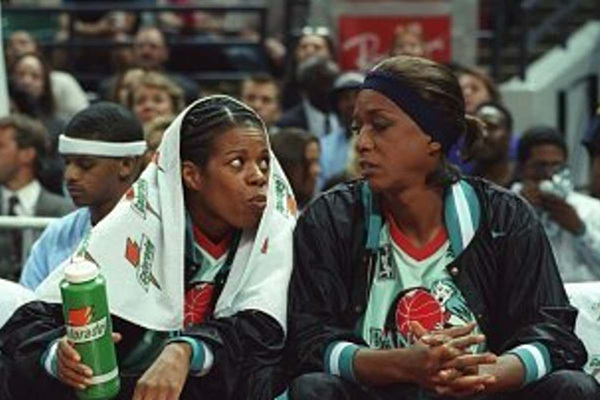 It frames women as sexual objects, courtesy of an embarrassing “scouting report” by Juwanna’s teammate (Kim Wayans) and when Juwanna congratulates teammates by literally groping them. (It’s cool. She’s bonding with them. Plus, they’re winning. But seriously, it’s disturbing in 2018.) It mocks seniors, one of whom tries to give Jamal a tongue bath at his aunt’s card game. If a kid was in a wheelchair, I’m sure director Jesse Vaughan and screenwriter Bradley Allenstein would find a way to push them down a flight of stairs. And since Juwanna Mann is as enchanting as a sweat mop, any charming act grates. I’m sure no one will be shocked to read that Jamal and Michelle end up together (this is after Jamal breaks up with his girlfriend, played by Lil’ Kim). What’s infuriating is how it happens. Jamal offers a lukewarm apology to the team for his ruse and then sends Michelle flowers on a Wednesday—because Jamal remembers her saying she liked being sent flowers for no reason. But there is a reason! Movies always push the “big apology” strategy for men as a salve for the romantically wronged woman. First, it allows men forgiveness with minimal effort. It’s a uniform solution that neglects how a woman feels. It teaches men to listen to keywords, respond to them like Pavlov’s dog, and pretend they’ve reached enlightenment. Second, it prevents a woman from making their own choice. All they can do is say “yes.” They can’t think about it. They can’t tell the man to go to hell and go back to reading their book or checking their email. They must be subservient, and respect the man for his bravery when all he’s doing is following protocol. And Jamal is never brave. He’s a double-agent now using the information for leverage. And Michelle, who dates a two-timing R&B crooner named Romeo (Ginuwine, who in one scene wears a translucent shirt with a suit jacket), gets pegged as a dope. I hope her friends intervened before the wedding invitations were mailed. Juwanna Mann proceeds like a laugh riot, but it as breezy as a #MeToo essay and, ironically, just as illuminating. Like the galoots who jump into a social media dialogue to chime about women’s athletics and its related topics, you wish that people involved with Juwanna Mann had done nothing. And you pray, not for the first time, that common sense is generational.